Imagine a future in which buildings tower miles over the streets below, tourists take day trips to the edge of our atmosphere, and multiple space stations can be spotted drifting across the night sky. To make this sci-fi vision a reality, we will need to create new kinds of structures that are lightweight but still strong and tough. A traditional approach to this design process would involve creating new materials, like superalloys – metals that are exceptionally strong and resistant to extreme temperatures. These advanced materials have enabled us to fly faster than the speed of sound and send rovers to Mars. However, we can’t simply “invent” new chemical elements, and there are only a finite number of ways to mix and match those that we already have. We therefore need to learn new ways to arrange currently available materials so that the resulting structures are stronger and tougher than the materials themselves. Thankfully, nature has wrestled with this same problem for hundreds of millions of years. Unlike engineers, however, nature doesn’t come up with new arrangements, or “mechanical designs,” using equations and computer algorithms. Rather, it produces many different designs through evolutionary mechanisms, like genetic mutation. Then, through natural selection, organisms with better designs often outlive those with worse ones and hand off the blueprints of those designs to their offspring through genetic inheritance. This evolutionary process can produce extremely efficient mechanical designs that often look nothing like those used in the engineered world. For example, I am studying sponges that live at the bottom of the ocean to learn new ways to make stronger beams – the structures that hold up everything from our homes to the frames of our cars and the bridges we drive over. 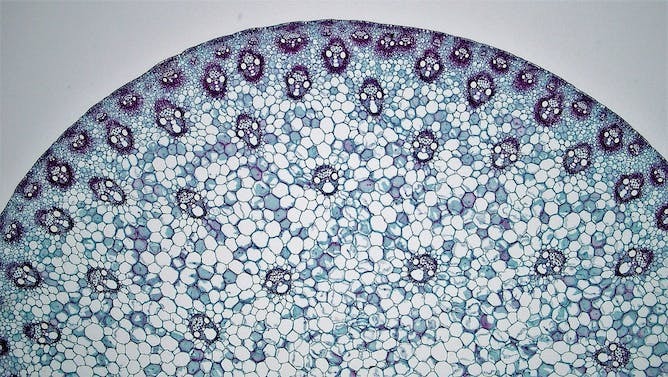 Bio-inspired engineering has become a hot topic in the science world. The goal is first to understand how a biological structure’s mechanical design enhances its performance, and then to apply the physics principles underlying that design to create new human-made structures. For example, the hard shells of clams and oysters are made up of aragonite, a brittle mineral that is the main ingredient in limestone. Clam shells are tough because this mineral is not randomly packed together, but rather is arranged in a pattern that looks like a microscopic brick wall. The interfaces between the bricks in this wall prevent cracks from growing in a straight path through the shell. Simply copying and pasting this design to create a new human-made structure would not necessarily give us a structure with the same toughness as the shell. Rather, bio-inspired engineering is a multi-step process. First, we identify the function of a natural structure. For example, the shell protects the clam from predators. Next, we quantify how that structure’s design affects its performance of that function – in this case, how strong and tough the clam shell is compared to aragonite itself. Finally, we want to explain the relationship between design and performance. For the clam shell, this would mean deriving an equation that relates parameters like the aspect ratio of the microscopic “bricks” in it to the shell’s toughness. What makes sponges so strong? Unlike a soft, squishy kitchen sponge, the marine sponge that I study, Euplectella aspergillum, is stiff and strong. It has an amazingly complex skeleton that consists of an intricate assembly of fibers, known as spicules, no larger than a human hair. 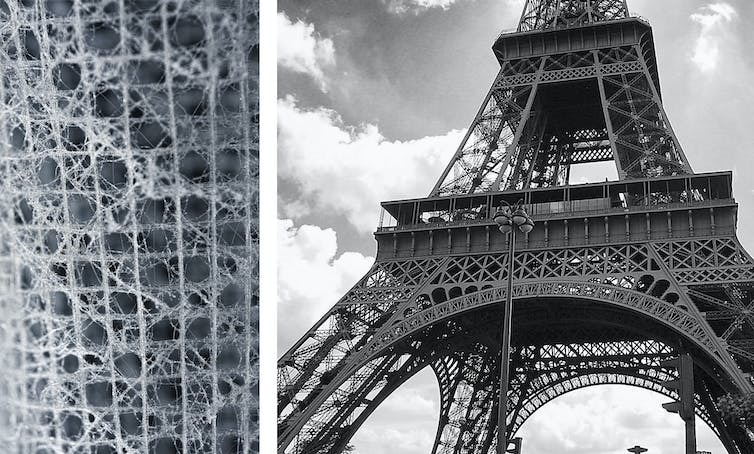 Their structural function is much like that of the thousands of beams that make up the Eiffel Tower. The sponge’s spicules are unusual because they’re made almost entirely out of glass! While we typically think of glass as a weak and brittle material, the spicules are incredibly strong and resilient. This contrast is what originally motivated me to consider what makes the spicules so strong – and how they can teach us to make stronger beams. My research focuses on a specialized group of spicules that act like roots to anchor the sponge to the soft sediment of the ocean floor. Remaining securely fastened to the ocean floor allows the sponge to pump water through its body and filter out microorganisms to eat. Like the clam’s shell, the anchor spicules also have a microscopic mechanical design. If you cut one open, you’ll find that the spicule’s glass is arranged in concentric layers that look a lot like tree rings. It’s possible that this mechanical design allows the anchor spicules to bend more before breaking, and therefore makes the sponge’s attachment more robust. I’ve explored this idea by measuring how much the anchor spicules can bend before breaking, and comparing them to spicules from another sponge that have the same chemical composition but do not have any layers. The results of this experiment show that E. aspergillum spicules can bend roughly 2.4 times more than the spicules without layers. The next step in my research is to understand why simply arranging the glass in concentric layers has such a large effect on bending strength. The plan is to derive equations that can predict the strength of a beam with a certain number of concentric layers and layer thicknesses – the third step of the bio-inspired engineering process. If my equations are correct, they should be able to accurately predict the strength enhancement that I measured. A few years ago I was part of a team that developed a theoretical model to make this kind of prediction. However, the equations that make up this model predict that the layers should increase the spicule’s bending strength by only a maximum of 33 percent – a far cry from the 140 percent increase that I recently measured in the actual spicules. This difference suggests that there is something missing in our model, and that we need to go back and revise these equations. A brief overview of bio-inspired engineering and our theoretical model of Euplectella aspergillum spicules. Once we have an accurate model, we could use the equations to design spicule-like, layered beams that are much stronger than today’s state-of-the-art structures. These layered beams could ultimately be used to make rockets, airplanes, and space habitats that are substantially lighter, and therefore more efficient, than the ones we use today. In a way, design secrets from the bottom of the ocean could eventually help us explore new worlds. This was originally published in The Conversation under a Creative Commons Attribution No Derivatives license. Read the original article here. Chapter 8 – Design and Modeling of Bio-inspired Lightweight Composite Panels for Blast Resistance is available now for a limited time on ScienceDirect. Two main toughening mechanisms of nacre are of special interests including the multilayer platelet structures and the interfacial waviness. The multiple laminate structure of nacre is composed of polygonal tablets bonded with organic adhesives to maximize its load-sharing capability. While the hard mineral tablets provide structural rigidity, the soft organic polymer matrix provides the mechanisms to mitigate damages and dissipate energy. This chapter presents an investigation on the influences of the platelet architecture on the blast resistance of two different nacre-like composite panels. A novel three-dimensional model of an aluminum/vinyl ester composite structure that closely mimics multilayer nacre’s platelet structure is proposed. Vinyl ester cohesive and adhesive layers are introduced between nacre-mimetic polygonal aluminum tablets and layers, respectively, to simulate the bonding and delamination process. 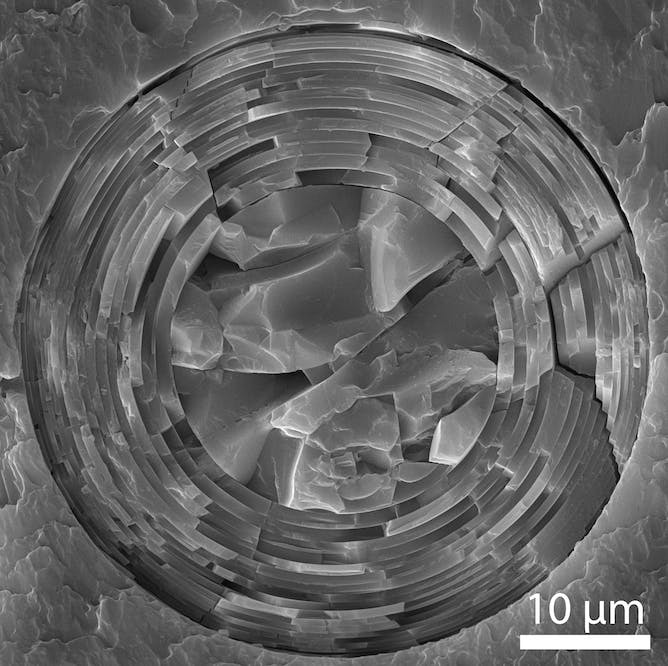 The performances of the nacre-like composite structures under blast loading are evaluated in terms of maximum deformation, damage distributions, as well as dissipated energy. The influences of size and shape of the nacre-mimetic tablets, as well as the number of composite laminates on the blast resistance of the composite, are also investigated. Results reveal the importance of tablet size and number of laminates as opposed to the insignificant influences of tablet overlapping.